Mondrian in Action teaches business users and developers how to use Mondrian and related tools for strategic business analysis. You'll learn how to design and populate a data warehouse and present the data via a multidimensional model. You'll follow examples showing how to create a Mondrian schema and then expand it to add basic security based on the users' roles. 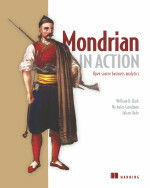 Mondrian in Action teaches you to use Mondrian for strategic business analysis. In it, you'll learn how to organize and present data in a multidimensional manner. You'll follow apt and thoroughly explained examples showing how to create a Mondrian schema and then expand it to add basic security based on users' roles. Developers will discover how to integrate Mondrian using its olap4j Java API and web service calls via XML for Analysis. Written for developers building data analysis solutions. Appropriate for tech-savvy business users and DBAs needing to query and report on data. William D. Back is an Enterprise Architect and Director of Pentaho Services. Nicholas Goodman is a Business Intelligence pro who has authored training courses on OLAP and Mondrian. Julian Hyde founded Mondrian and is the project's lead developer.